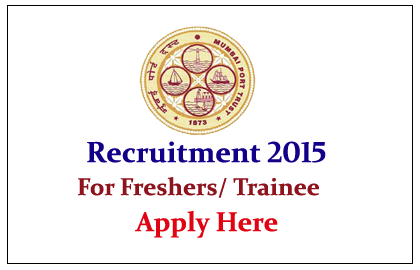 Mumbai Port Trust is recruiting for the Post of Graduate, Technician and Trade Apprentices. 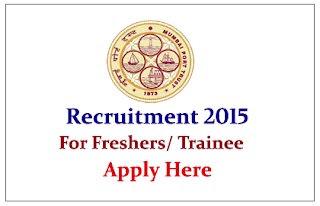 Eligible candidate can apply here on or before 11th August 2015. Company Profile: Mumbai Port Trust (MbPT) is an autonomous corporation administrates the Mumbai Port. The Mumbai Port Trust is wholly owned by the Government of India. The Mumbai Port lies midway on the West coast of India, on the natural deep-water harbour of Mumbai. From its establishment, the port has been the gateway to India, and was a primary factor in the emergence of Mumbai as the commercial capital of India. · Time: 10.00 a. m. to 5.00 p.m.
How to Apply: Interested and eligible candidate can send filled application form to the mentioned address on or before 11.08.2015. For more details kindly check official notification.